Bread is a staple on our homestead. We spread it with peanut butter, toast it with garlic, dip it in soup, and sometimes just eat it straight out of the oven. 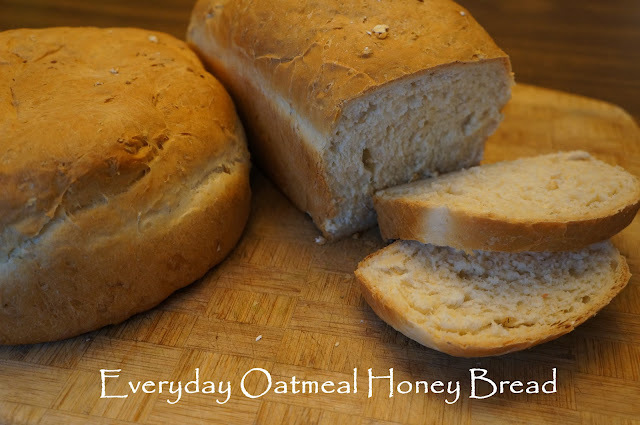 If you are looking for a slightly sweet, daily bread, this recipe is a great place to start. If you're new to baking bread, the idea of working on something for hours, kneading it and timing everything perfectly may be enough to send you running for the grocery store. Before you do, try out a few recipes, and give yourself a chance to learn the steps and before you know it the whole process will start to seem easy. When you set the goal to bake your own bread, you're committing yourself to providing delicious, healthy food for your family. When bread baking becomes part of your routine, the task becomes less overwhelming, and even the simple repetitive rhythm of kneading can serve as a type of relaxation. Whether you are a bread baking newbie, or a seasoned baker, this recipe is a must have for your repertoire. Combine warm water, milk, yeast, honey and brown sugar in a small bowl. Wait about 10 minutes until the whole mixture gets frothy and foamy. In a large bowl combine flour, oats, and salt. Work the butter into the flour mixture with your fingers or a mixer. Add the yeast mixture to the flour mixture and combine. You want your dough to come together. If it is too sticky, add more flour. Knead the dough for about 10 minutes when the dough becomes elastic. You can also use a sturdy mixer with a hook to knead the bread. Put dough in a lightly oiled bowl and turn the bread to cover. Place in a warm spot to rise until doubled in size (about 1 hour). Punch down and let rise for 30 additional minutes. Remove bread from bowl and divide into 2 pieces. Knead each piece for several minutes and form into loaves and place into lightly greased pans. You can put loaves in loaf pans or form the bread into round cake pans. Cover and let rise for 1 more hour. Preheat oven to 350 F and bake bread for 35-40 minutes or until bread appears golden. Let cool in the pan for 10 minutes and than place on a wire rack to cool completely and enjoy! Of course a few helpers always make the bread taste that much better! 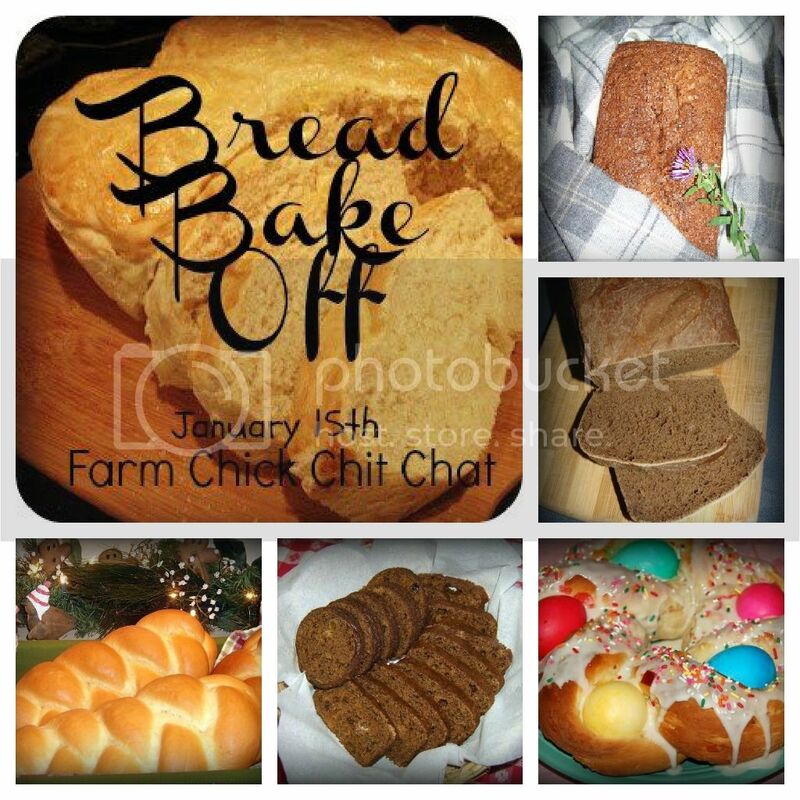 Check out the other breads at the Farm Chick Chit Chat site! This little helper is my dough eater - he simply can't resist. Ooooh, looks so good! I'm not a regular bread maker, but you have inspired me to try! This recipe sounds delicious. That looks delish! I need to make bread today or tomorrow anyway, so I'll give it a try! I'll have to try your recipe. Last time I made oatmeal bread it was way too dense for me. I made this bread today and it is wonderful. I'll defintely be making this again and often.